Posted by Tom Sarbeck on April 12, 2019 at 11:37pm in Science! A. The scientific method requires confirmation by others. Who will confirm this claim? B. Scientists tell their peers of achievements in journals and at conferences. Give some thought to reasons why these people are using popular media. Stephen, I know you better than that. Don't pull that on me. WASHINGTON (AP) — The newly pictured supermassive black hole is a beast with no name, at least not an official one. And what happens next could be cosmically confusing. The team of astronomers who created the image of the black hole called it M87(asterisk). (The asterisk is silent.) A language professor has given it a name from a Hawaiian chant — Powehi — meaning "the adorned fathomless dark creation." And the international group in charge of handing out astronomical names? It has never named a black hole. Technically, our own galaxy — the Milky Way — has never been officially named by the IAU, said Rick Fienberg, an astronomer and press officer for the American Astronomical Society. He said, "that's just a term that came down through history." The image may be meaniningless but does that doesn't mean that there are are aren't gravity wells? Chris, what is your evidence for the existence of gravity wells? The astrilogical measurements that were done as informed in the following link is a clue for gravity wells. Information such as the super massive black hole image should be distributed to the general public. Perhaps the main problem is it's distributed in the same tone withing the same media conglomerates that tout Kardashians breast, or buttock enlargment surgery. Chris, if you believe Ethan Siegal you will believe Donald Trump. Not familiar with Ethan Siegal - Looking it up I see he's a science fiction writer. At first meantion I thought he might have been (the plumber) Leonard Susskind. Perhaps I mistakenly linked the two names together because they are both from the Bronx. In sarcasm I don't believe in Donald Trump. Is he a real person or a figment of some unhinged political faction? There was a time and phylosophy where and when broadcast be it Radio, TV, or Internet was thought to be for educational and information rather than commercial and entertainment porposes. Apparently the idea that some of these institutions would be used for the beterment and knowledge of society is a fanticy - perhaps even Universities as much as many market their sports teams - even worse cheer leaders for entertainment. (Obvious sarcasm and disgust). Fortunately there are still public libraries. First ever image of SUPER-MASSIVE black hole –how big is it? Stephen, you know the religious method well; without evidence you believe what you are told. The scientific method requires confirmation by others. Advances in computational imaging and general relativistic modeling helped make sense of petabytes of telescope data. Last June, members of the Event Horizon Telescope (EHT) team convened in Cambridge, Massachusetts, to see if they could combine the data from eight telescopes into a single, clear image. The researchers had their work cut out for them. Over the course of four days in April 2017, the EHT telescopes had stared at the supermassive black hole of Messier 87, an elliptical galaxy 55 million light-years away in the Virgo cluster. 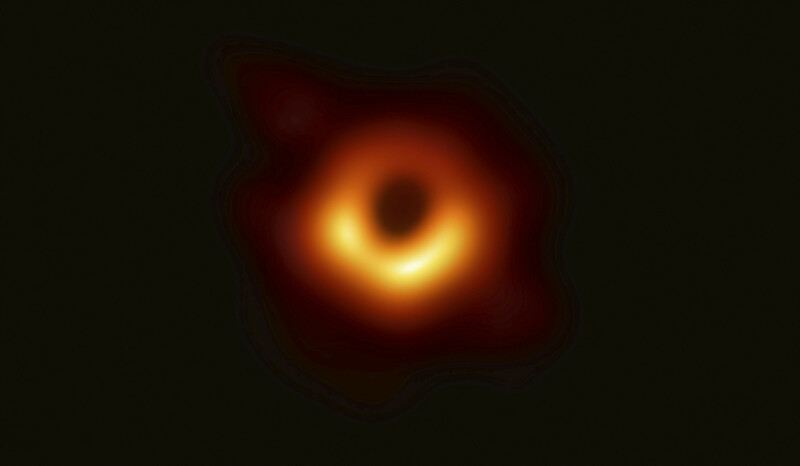 Three orders of magnitude as massive as the one at the center of our galaxy but also three orders as distant, M87’s central black hole (M87*) has an apparent diameter of 40 microarcseconds, roughly the size of the date on a quarter in Los Angeles as seen from Washington, DC. The telescopes—some single dishes, others multi-instrument arrays, and all susceptible to systematic noise—had viewed the tiny target from slightly different angles and had encountered varying degrees of atmospheric turbulence when collecting the 1.3-mm-wavelength photons. The technique of linking distant radio telescopes to form a virtual telescope the size of the distance between them, known as very long baseline interferometry, wasn’t new. But no one had ever tried to crunch the data from so many telescopes at such short wavelengths to view something just 40 μas across. As we now know, the EHT team succeeded in “seeing the unseeable,” as project leader Sheperd Doeleman of MIT put it during a 10 April press conference in Washington. Just as he and his colleagues had hoped, the team was able to resolve superheated plasma streaking just outside the photon orbit radius, the distance from the center of a black hole at which any inward-moving photon no longer has a chance to escape (as opposed to the event horizon, where nothing, regardless of its motion, can escape). The details of how the image came to be, particularly the computational processing and the simulations that validated the derived image, appear in a series of papers published in Astrophysical Journal Letters. The first step in imaging the black hole was to develop an enormous virtual radio telescope (see Physics Today, November 2008, page 14). Doeleman and his team achieved that feat by coordinating observations made at eight stations at six locations in Arizona, Hawaii, Mexico, Chile, Spain, and Antarctica. In multiple 3- to 7-minute scans on 5, 6, 10, and 11 April 2017, the telescopes observed M87*, along with other objects for calibration purposes. In the subsequent months, hard drives with the data, all of them stamped with times derived from the atomic clocks installed at each telescope station, were shipped to MIT and the Max Planck Institute for Radio Astronomy in Bonn, Germany. There the datasets were combined, calibrated, checked, and then recalibrated numerous times. Once the data were calibrated, the researchers had to turn them into one static image. With no blueprint of a previous comparable project to guide its progress, the collaboration decided to divide the 50 or so scientists dedicated to imaging into four groups, each of which would crunch the M87* data in a different way. Two relied on a nearly half-century-old, tried-and-true computational imaging method called CLEAN; the other two used a more recently developed technique, regularized maximum likelihood (RML). Over the past few years, Katie Bouman (now at MIT, soon to join Caltech), Andrew Chael (Harvard), and colleagues have honed RML for the black-hole project by computationally cancelling out effects of the atmosphere and incrementally piecing together complete images. The work in each group was kept confidential. After seven weeks of analysis, each group submitted its end result to a web portal. The imaging efforts came to a head at the weeklong June 2018 meeting in Cambridge, Massachusetts. Over the first few days, the four groups met separately but then began to share details about the intricacies of their analyses. Finally, on 25 June, the entire EHT imaging team viewed all four images. They weren’t identical, but they all shared a fundamental feature: a roughly 40 μas photon ring surrounding an orb of darkness, the long-sought silhouette of a black hole. “It was a remarkable moment,” says imaging team coleader Kazunori Akiyama of MIT.